Bio: Waif Mullins was born in Jackson, Tennessee, but has lived in Northern California (Chico)for most of his life. After his Bachelor of Arts degree at California State University (1972), Waif completed a Masters Degree program in 1980. Waif is a Signature Member of the Pastel Society of America, a member Society of Western Artists, and of the Pastel Society of the West Coast. Waif began teaching oil painting and pastel painting classes in 1998, and has given demonstrations and critiques for artist organizations throughout the Sacramento and San Francisco Bay Area.His paintings have received numerous awards from regional and National juried art exhibitions. In addition, Waif’s work has been featured in national art magazines, including The Artist’s Magazine (August 2003 issue in Greg Schaber’s cover story article, "Secrets to Sparkling Water"); and in Pastel Artist International. 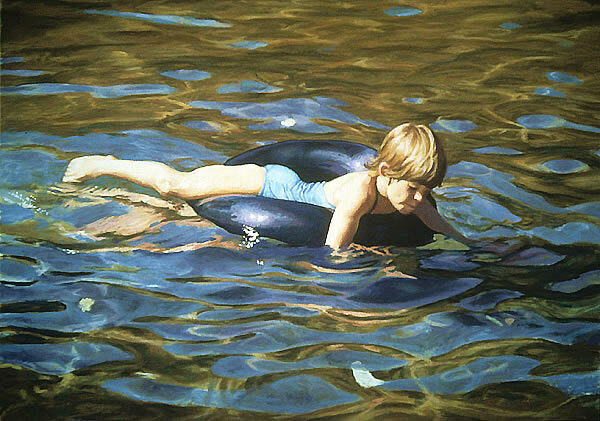 Awards for his work include the Wakeham/Sutherland Award (1st Place) in the 2003 Pastel Society of the West Coast 17th Annual International Open Exhibition. Subjects: Landscape ; Figurative ; Still Life. Artistically, I think of myself as a dramatist. Whatever the subject, whether painted from life or developed from photographic references, I search for a dramatic presentation, through the use of lighting to reveal form, orchestration of color and value to lead the viewer through the painting and to focus attention on the main subject. Relationships of scale are used to add depth and enhance the sense of reality. Navigation: Main menu is in small print at bottom of page. Gallery links are at the top. There is internal evidence that the website has not been updated since 2011. Gallery: Landscapes ; Figures/Portraits ; Still Life. Image View: Thumbnails enlarge in a viewer, and may be scrolled through, or chosen from the many pages of thumbnail. An image-rich site, rewarding the curious explorer. Information is provided on medium and dimension. Free Floating is 600 x 421, 72 KB.